What was known as ‘The Golden Age of American Circus’ lasted, roughly, from the last quarter of the 1800’s through 1950. During that time, circus as an industry got a huge boost from the expansion of the transcontinental rail system and managed to survive the Great Depression. 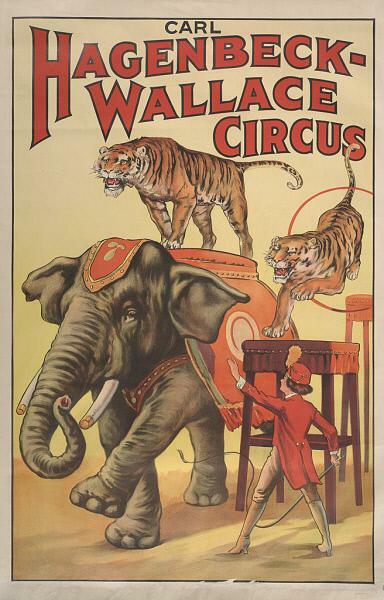 The poster advertisements from this era remain so wonderfully iconic - and the Ringling Museum website hosts an impressive 4,977 of them in one of their digital archives. I am now the proud owner of the metadata for the entire archive - thanks to Python scraping. I was surprised to find such an enormous array of troupes represented in the archive. Ringling and Barnum, Sells and Floto - these were givens. But then I found Carl Sagenbeck's troupe and the Zallee Brothers' and on and on. So for my first exploration into the data, I asked Python to parse through the title fields collecting and counting troupe names. This then lead me to realize troupe co-appearances on posters were an especially significant part of America circus history. Gephi allowed me to then upload that data for network analysis. From there I started wondering how intense these advertising campaigns were in relation to the amount of traveling troupes did at the time. So, using Circus Historical Society's posted route schedules against the date fields and troupes appearing in Ringling's poster archive, I matched up ad campaigns to an individual show's route. As an additional side/pet project I pulled all the text from the posters' title and description fields to run through a text analysis tool, Voyant, and come up with a hierarchy of animal acts as represented in the archive. The resulting project site is called Tack Spitter Circus after the original Tack Spitters - who traveled ahead of the circus to post these kinds of advertisements by spitting tacks held in their mouth onto a magnetic hammer.